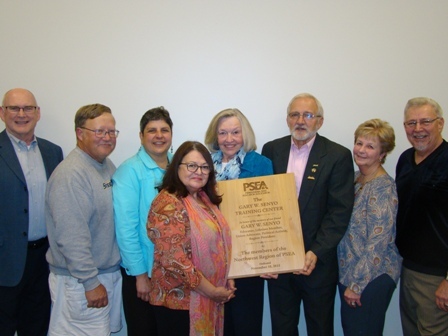 At the fall House of Delegates, the Northwestern Region PSEA dedicated the education center at the region office to Gary Senyo. 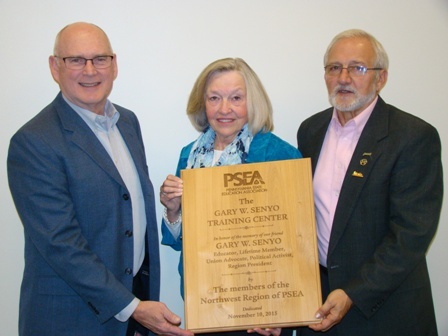 Senyo, a past NW PSEA Region President, PSEA-Retired officer and PACE Director passed away suddenly last spring. Shown below are NW PSEA-Retired Vice President Richard Eberlin, NW PSEA-Retired PACE Director Becky Travis and NW PSEA-Retired President Ron Bennett. PSERS Acting Executive Director Terrill J. Sanchez today issued an alert to all PSERS’ active and retired members about a recurring telephone scam in which PSERS’ members are contacted by individuals claiming to be with the U.S. Treasury or Internal Revenue Service. These individuals state there is an issue with their PSERS’ benefit. This is a telephone scam and members should immediately hang up. Never give out billing information over the phone, especially if you receive an unsolicited telephone call from a stranger. Never forget that you are in control. You can always hang up, find a company's number and call it directly. Remember this rule of thumb: never give out sensitive information to anyone on the phone unless you initiated the call to a company you are certain is legitimate.